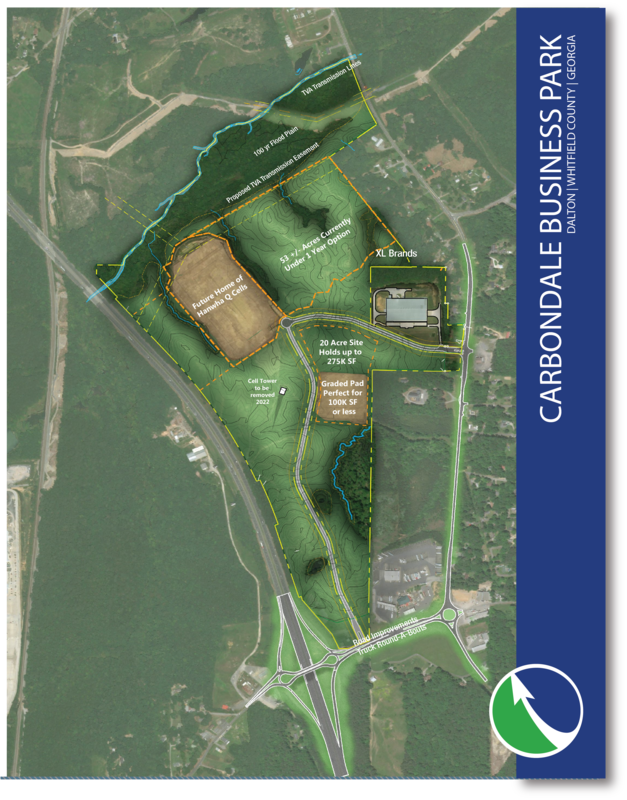 Carbondale Business Park is a shovel-ready industrial and commercial site located on Interstate 75 in Dalton, Georgia, ready for manufacturing, warehousing, and distribution. Publicly owned, there are 238 available acres with all utilities available to serve industrial operations. Carbondale Business Park is just 30 minutes from Volkswagen in Chattanooga, and conveniently located on I-75 in the manufacturing hub of the southeast. Carbondale Business Park has been designated as a Georgia Ready for Accelerated Development (GRAD) site by Georgia Allies. Fits buildings up to 1,000,000 S.F. 10+/- Acre Graded Sites Available for Development. Site expandable to 20 acres. Carbondale can accommodate heavy and light industrial manufacturing operations and also offers development sites for commercial and retail establishments. The map below shows a layout of the land available for sites. XL Brands is the first building in the park, a 122,000-square-foot facility to handle adhesive production and shipping. The proposed road going North and South is now complete. Sites from 3 acres to ~75 acres can be accommodated. Improvements to the interchange at I-75 are in progress and slated to be complete in the fall of 2018. The exit is still a full-service exit during the remodel process.